1) What are your plans for this Saturday morning? Sleep in a little, read Saturday 9 blogs and relax. I will watch the St. Louis Cardinals at noon...Spring Training baseball. 2) In this song, a man sings of going away for the day with a friend. Where did you go on your last day trip? I can't even remember my last day trip, so I will say when my co-workers and I went to Lebanon, MO for some curriculum training back in August. We did go shopping afterwards. 3) The lyrics say, "we will remember long after Saturday's gone." What's something you've done recently that you predict you'll remember for a long time to come? Maybe when we went to see Nutcracker at Christmas with my mom. We went to dinner afterwards. It was fun. I think we are going to plan to take her to see Les Miserables next. We saw Phantom of the Opera last Spring, but we did not take my mom and I wish we would have. I am not sure she has been to a theater production. 4) This song was the Oscar-nominated theme from the movie The Sterile Cuckoo. What's the first movie song that pops into your head? Shallow from a Star is Born. Did anyone see the Oscars? That performance was fantastic! I did get to see the movie before the Oscars too, it was great! 5) In the movie, Liza Minnelli played Mary Ann Adams, an eccentric girl everyone called "Pookie." Have you ever been known by a memorable nickname? Who gave it to you? My dad called me Sapphire ...(my birthstone). The kids at school have great nicknames for me because they cannot say my name...hahahaha...one of them calls me Mrs. Yay...my last name is Ray, one boy calls me Mrs. L. I love it. 6) Today's group began their career as The Grads. Recording artist/producer Herb Alpert liked their sound but hated their name. 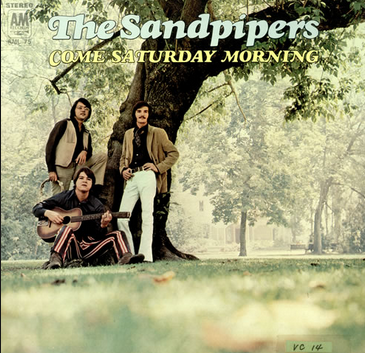 Alpert picked "sandpiper" at random out of the dictionary. Do you still have and use a bound dictionary? Or do you rely on the internet for word searches and spelling? I use the internet more now than a dictionary, but I am certain I have one around here somewhere. 7) The biggest news story of 1969, the year this song was popular, was one of the biggest news stories of all time. On July 20, Neil Armstrong stepped foot on the moon. Other than the moon landing, what's the most consequential event that you've seen in your lifetime. How do you feel it changed America, and the world? 9/11/2001 hands down is the most consequential in my lifetime. I was shocked and scared for days. Josh was only 3 years old. It changed so many things, purse checks at places...ball games, concerts, etc....also airport searches. 8)1969 was a big year for music festivals, with Atlanta, Toronto and Woodstock all holding famous fests. Have you visited Georgia, Ontario or New York (state)? I have driven through Georgia on my way to Florida, but that is all. 9) Random question -- According to some plant enthusiasts, house plants do better when they're spoken to. Do you talk to your plants? I do believe this, something about the air from your voice giving the plant nutrients. I think I may have used to do this, but over the years I stopped and my plants have all died. I need to get some more indoor plants. I like some life in the house in the form of plants. I picked Shallow, too! Like you, I loved them at the Oscars. I think it's cool that you and your mom are making theater memories. I have yet to see the new Star is Born. I hope you have a great Saturday! So sweet of you to plan special outings with your mom. As one, I can affirm how much it means to her. I love going to the theater! I am lucky that there are a number of theaters in the state plus Broadway is only a couple of hours away. I am going to see Beautiful, the Carol King Story this month it is playing in Hartford this month. Good memories of times with your mom!! Enjoy her!! Fun answers to some interesting questions this week!! I need to see A Star is Born. I really like Gaga! Enjoy your weekend! I think having children (and, in my case, grands) made 9/11 all the more sobering and scary. I missed seeing Lady GaGa and Bradley Cooper's performance, so appreciate your reminder; I'm going to look for it online today! You are going to love Les Miserables Lori. It's one of the great ones along with Phantom of the Opera. It's killing me that the Yankees Spring Training games are being broadcasted this year. Only 1 so far and 1 was rained out. At least I get to see one tomorrow if the storm holds out and I don't lose electricity. The next one is on March 25 before their season opener on the 28th. Have a blessed day my friend. I picked 9/11 too. I think it was a major game changer for the country. I agree about 9/11...I think it and the way things have played out since have really changed the way we view ourselves on the world stage and how the world views us. What a beautiful song and performance you have running through your head. I feel a connection to my plants, too. I used to sing to them. I imagine Angels standing next to them, smiling at me.